The tower of the Penitentiary Chapel, which is now a National Trust property, is the key landmark (building E on the map). 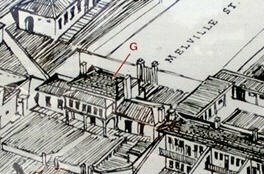 Melville St is further to the left of the Chapel, on the other side of the site, and ended abruptly at the Governor’s Quarters (building G). 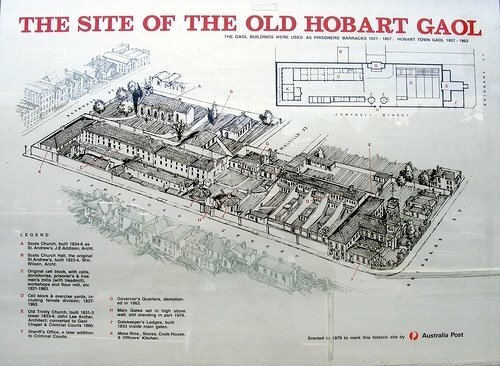 Photo taken of map pasted to a window at the Penitentiary Chapel Historic Site, Campbell St. Hobart. Copyright © KLW NFC Imprint 2008 ARR. 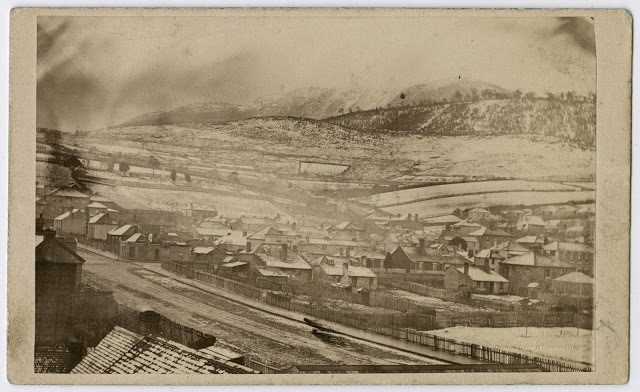 The photograph (below) was taken by Thomas Nevin in July 1868 on a day of heavy snowfall. 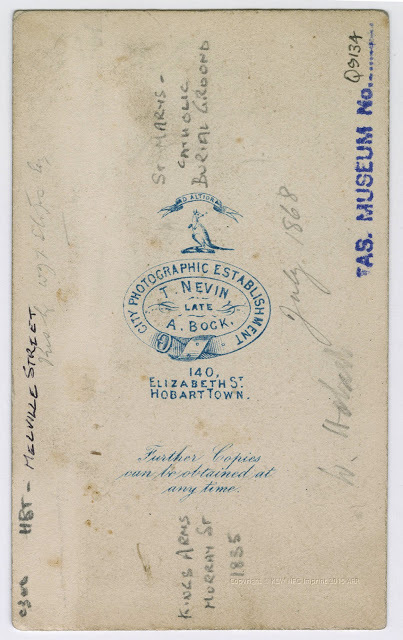 The verso of this photograph carries Thomas Nevin’s most common commercial studio stamp and the wording “This by W. J. T. Stops Esq.“which suggests that the photograph was presented to Frederick Stops by Nevin in 1868, perhaps as a gift to Emily Stops on the birth of their daughter, and was then passed down to his son W. J. T. Stops, who subsequently donated it to the Tasmanian Museum and Art Gallery from the Stops estate or even from the University archives (Royal Society Collection) where more of Nevin’s photographs are held. It was then inscribed by an archivist on accession with the note – “This by W.J.T. Stops Esq“. Frederick Stops and photographer Thomas Nevin were well acquainted for several reasons, the first being the dissolution of Thomas Nevin’s partnership with Robert Smith operating as the firm “Nevin & Smith” in February 1868 which was underwritten by Frederick Stops’ employer and Nevin’s family solicitor, the Hon. W R. Giblin, Attorney-General. Thomas Nevin exhibited this photograph at the Wellington Park Exhibition, Hobart, in July 1868. It was reproduced in the publication Tasmanian Photographers 1840-1940: A Directory (Tasmanian Museum and Art Gallery, 1995:82). Nevin’s chosen position to take the photograph was from the second storey of the Governor’s Quarters. 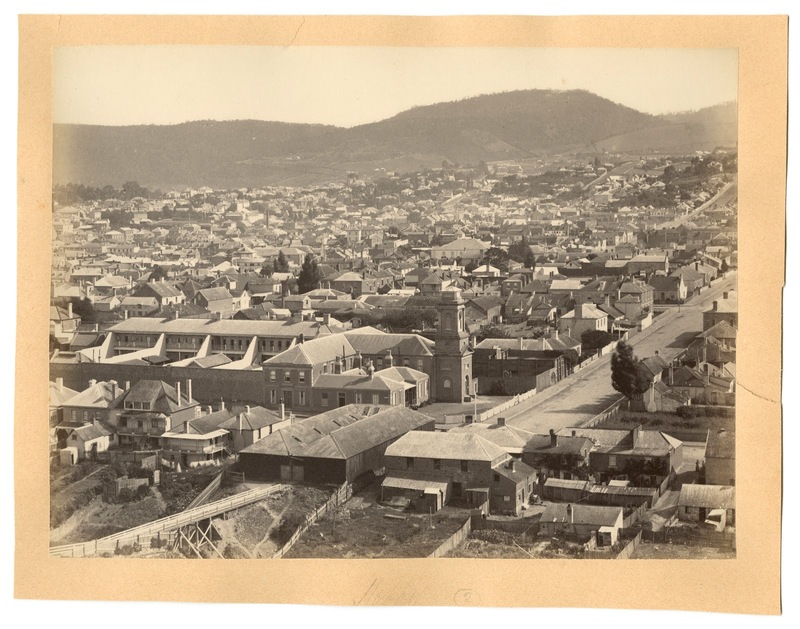 His camera captured the right side of Melville Street, and a wider vista of Mount Wellington to the north west. This photograph is yet another which suggests Nevin’s association with the Hobart Gaol administration in 1868 when his solicitor W.R. Giblin, later Attorney-General, acted on his behalf to dissolve his partnership with Robert Smith, of the firm Nevin & Smith. A few years earlier, ca. 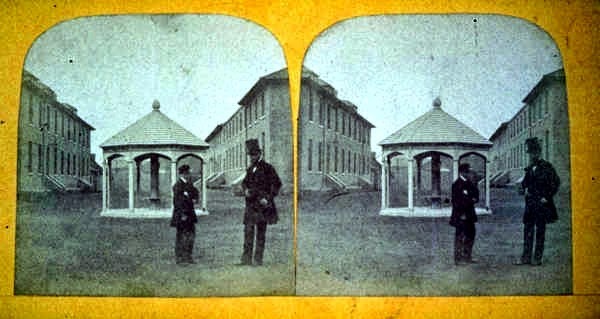 1865, Thomas Nevin’s younger brother Jack Nevin (Constable John Nevin) posed for a photograph in the courtyard of the Hobart Gaol, seen in this stereograph, left hand on hip, in the company of a prison official, possibly the Superintendent T.P. Ball. 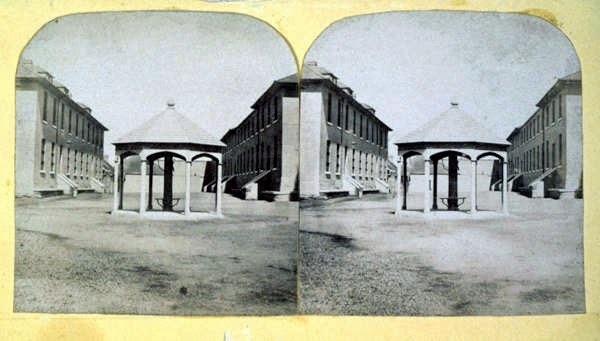 For further discussion of this stereograph, see this article here. 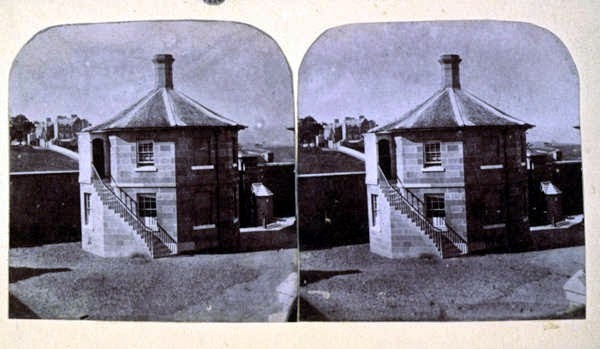 This stereograph, and others taken at the same time and place of the Prisoners Barracks (see below) are held at the State Library of Tasmania, and although unattributed, they were most likely taken by Thomas Nevin working with Alfred Bock between 1863-1866 at their studio, 140 Elizabeth St. Hobart. The Nevin brothers’ association with the Hon. 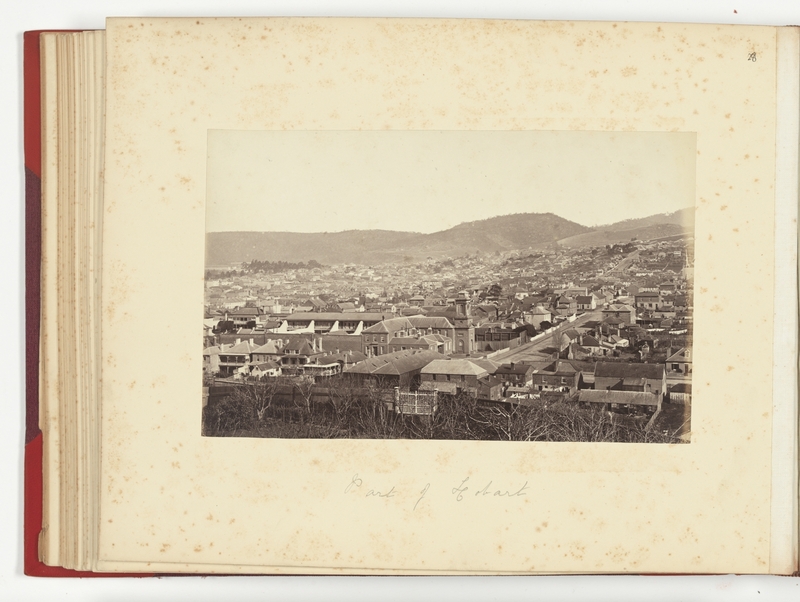 W. R. Giblin and the Hobart Gaol continued throughout the 1870s and 1880s while Nevin was contracted to the Municipal Police Office as prisons photographer, both as a commercial photographer on tender, and as a full-time civil servant. His principal studio, The City Photographic Establishment, was located one block away, close to the corner of Melville and Elizabeth Streets directly to the west. During his contracted years under tender he used the studio to display photographs of absconders and others under warrant. His younger brother Constable John Nevin was a salaried employee and resident in training as keeper of the Hobart Gaol (H. M. Prisons) from the early 1870s until his death in 1891. He acted as his brother’s photographic assistant and eventual prison photographer in the 1880s. Title: The Gaol Governor’s House which blocked Melville Street. Notes:Monochrome photograph laminated over a white cardboard mount. The prison walls of the Hobart Penitentiary flank either side of this two storied house. The road surface in front of the house is uneven and unsealed. The house was in use in from the 1850s until November 1960. It was demolished in 1963. 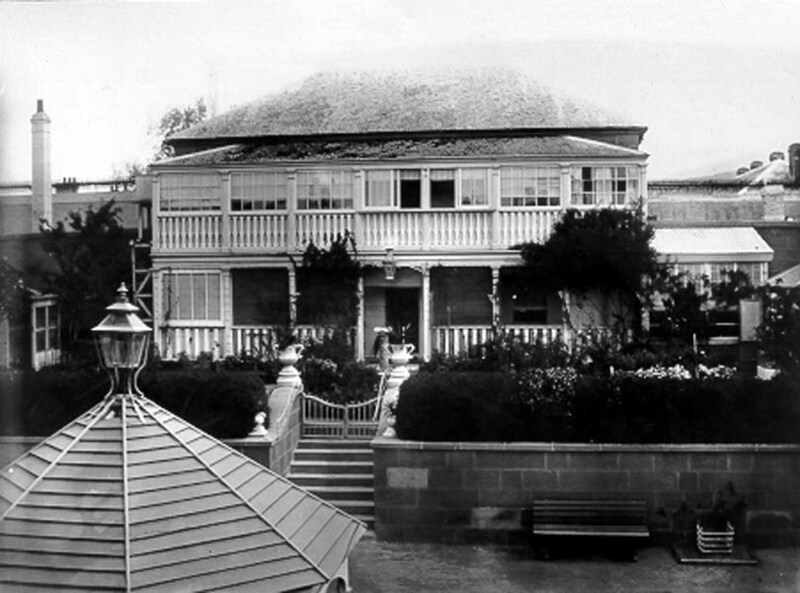 It was from this building, which by 1900 was called the Superintendent’s house, that Nevin took the Melville St. photograph. 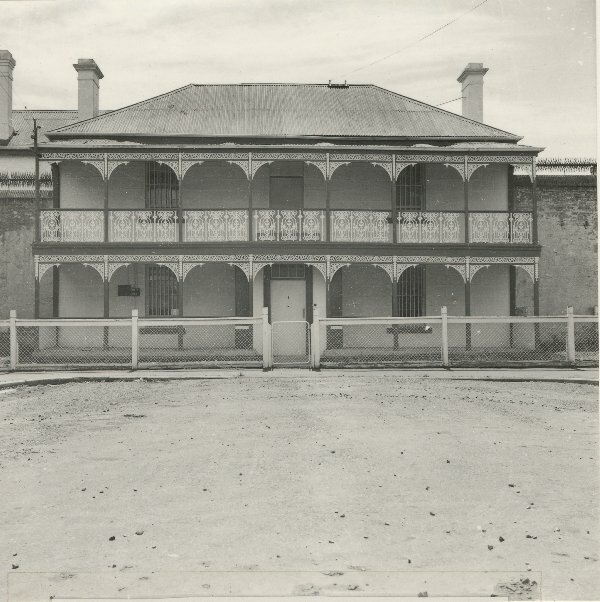 The public entrance to this building was from Melville St, which terminated at its front gate (photo above), rather than the Gaol’s entrance in Campbell St (photo below). 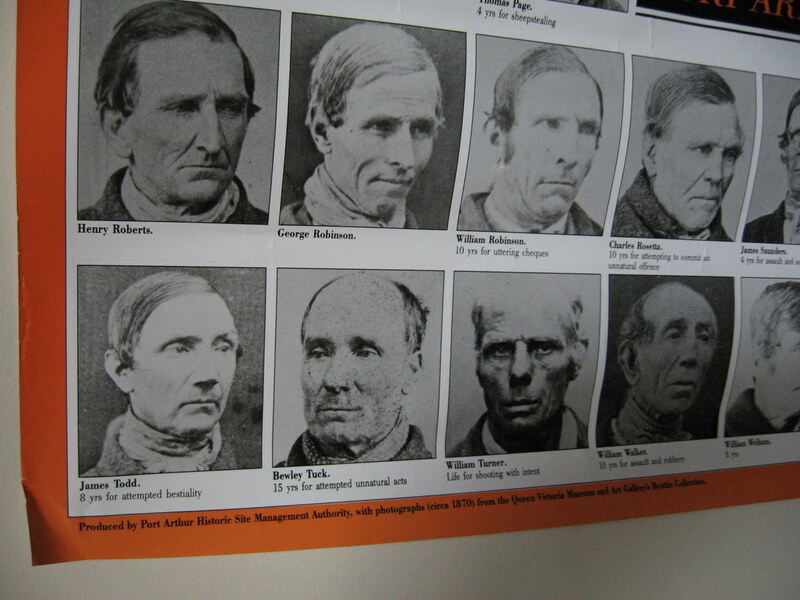 These identification photographs of convicts were taken by the Nevin brothers at the Hobart Gaol and at the Town Hall Municipal Police Office. Photo © KLW NFC Imprint 2008 ARR.